Beaches Edge villa has a smart design that maximizes the ocean views. Of course there’s a pool, daily maid service, and a concierge, but there’s also full air-conditioning, an outside barbecue, a media room, a washer/dryer, and even a gazebo. With five king/queen suites, there’s plenty of room here for couples or family alike. Beaches Edge Villa overlooks the deep blue waters of Pelican Bay. This sleek, modern villa was designed to emphasize its natural surroundings. Beaches Edge’s lush gardens borders a covered two-car carport and an entry courtyard. The villa is surrounded by panoramic views of the Caribbean Sea and the mountains of St. Martin, and has a short path to a secluded sand beach. Beaches Edge supplies snorkeling equipment, so guests can explore the reef at their leisure. Guests also have preferred access to Anguilla Tennis Academy and CuisinArt Golf Resort and Spa. 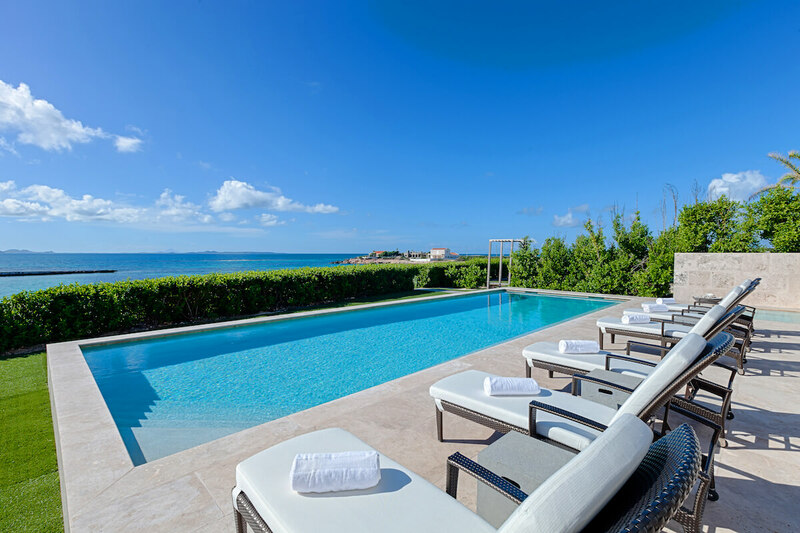 The sun-drenched oceanfront terrace holds several loungers, an infinity pool, a Jacuzzi, and a kiddie pool. The veranda shades an outdoor dining table and a grill, and leads into the well-decorated living area. WiFi and air-conditioning are in every room, and floor-to-ceiling windows let the views outside become artwork inside. Travertine tile, wood accents, and hints of blue unite the common areas into a modern, cohesive space. The spacious Great Room has a 55-inch TV, a half bath, books, movies, games, and a dining table for 8. The fully-equipped kitchen has stainless premium appliances, granite countertops, a Dacor 36” built-in oven, a Thermador 36” gas cooktop, a Gaggenau exhaust hood, a Miele dishwasher, a Sub-Zero36” refrigerator, and a breakfast bar. Beaches Edge has three king suites and two queen suites. Most of the bedrooms are upstairs and one king suite is on the main floor. All five suites have an ensuite bathroom, ocean views, and a flatscreen TV. The upper level king suites both open walk-out balconies and have lounging areas. The housekeeper visits daily, and guests have a personal washer and dryer. Beaches Edge is secluded and private, but still near the West End’s world-class golf, tennis, beaches, snorkeling, diving, boating, music, resorts, and the island’s finest restaurants. Blowing Point Ferry Terminal is only five minutes away. Weddings and events can be hosted at Beaches Edge, but larger events must use wedding coordinator partners. Upon arrival guests will take a taxi to the villa for an orientation of the property.